The German V-2 rocket was a ground-breaking design and ushered in the age of guided missiles, and was ment as a Vergeltungswaffe (Retribution Weapon) to reduce British cities to dust. It was more fearsome than the previous V-1 ‘doodlebag’ as nobody would hear the V-2 coming as it went faster than the speed of sound. Combined with it’s 1000kg warhead, it is estimated to have killed 9,000 civilians and military personnel. After the war, the Allies took a few of these rockets with them for testing purposes. This paved the way both intercontinental ballistic missiles as well as the space program. In many ways the V2 was a groundbreaking and recordsetting design. It was capable of reaching the outer limits of our atmosphere, as well as reaching speeds well over mach 4 during its descent from these heights. This article is partially based on information found at wikipedia, 27th april 2015. 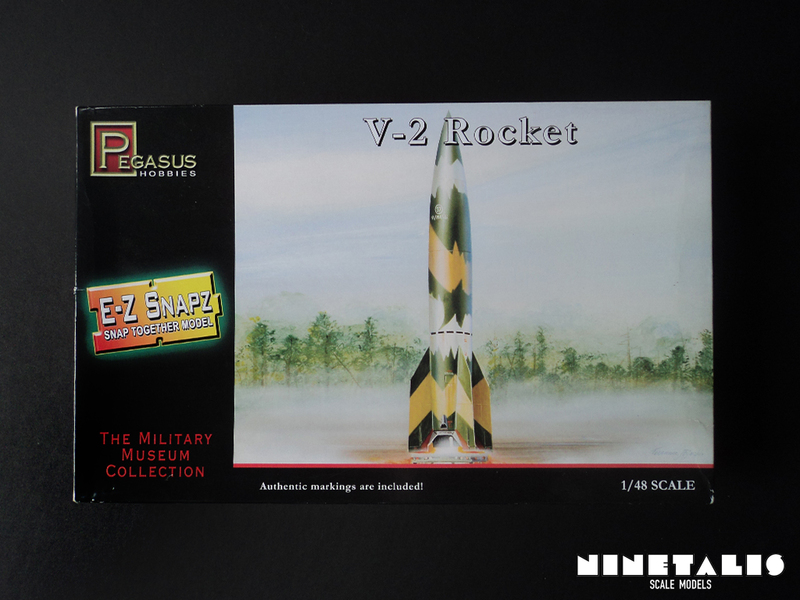 Pegasus’s ‘E-Z Snapz’ kits are meant as kits for beginners of our hobby. Cheap, a low parts count and good fit are the key points of these series. 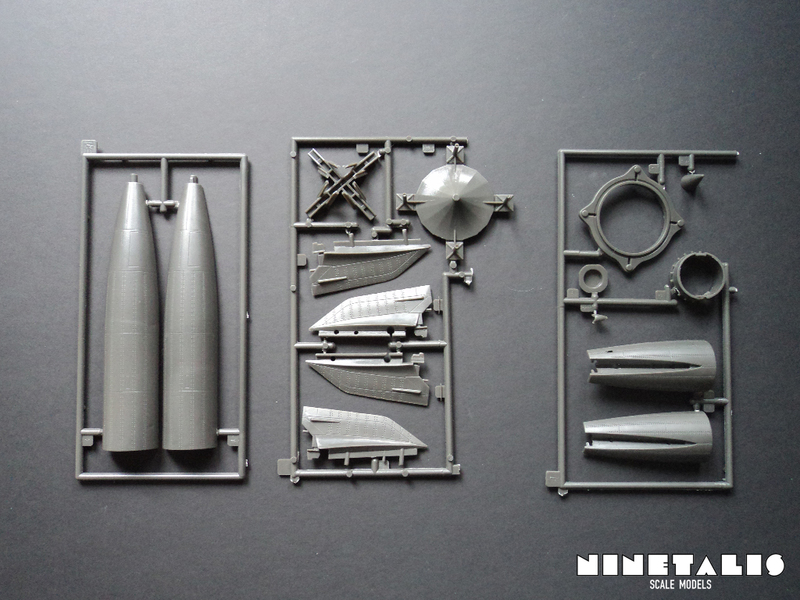 Pegasus does its best with these kinds of kits, and the V2 rocket version is the best one of all, because it is a great (and only) option for anyone wishing to build a V2 in this scale. 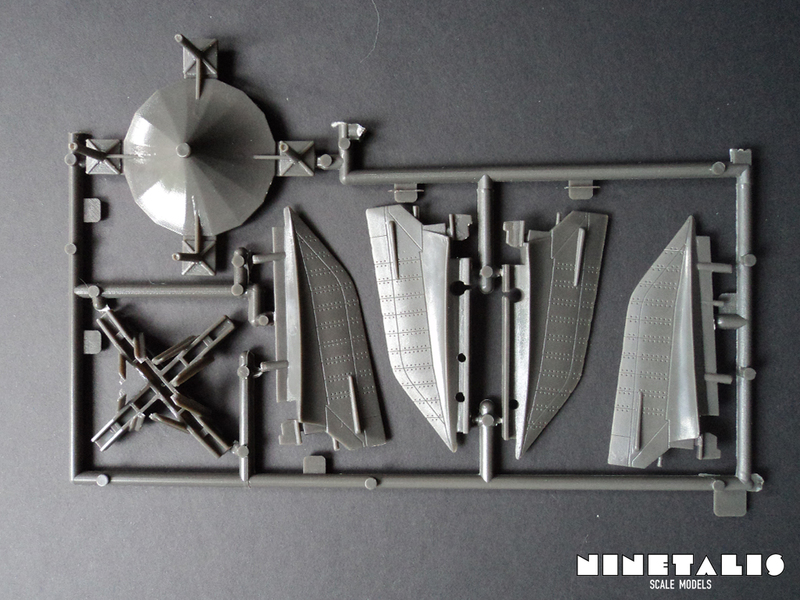 It only features 15 parts, but these are more than enough for a scale replica of this weapon of mass destruction. 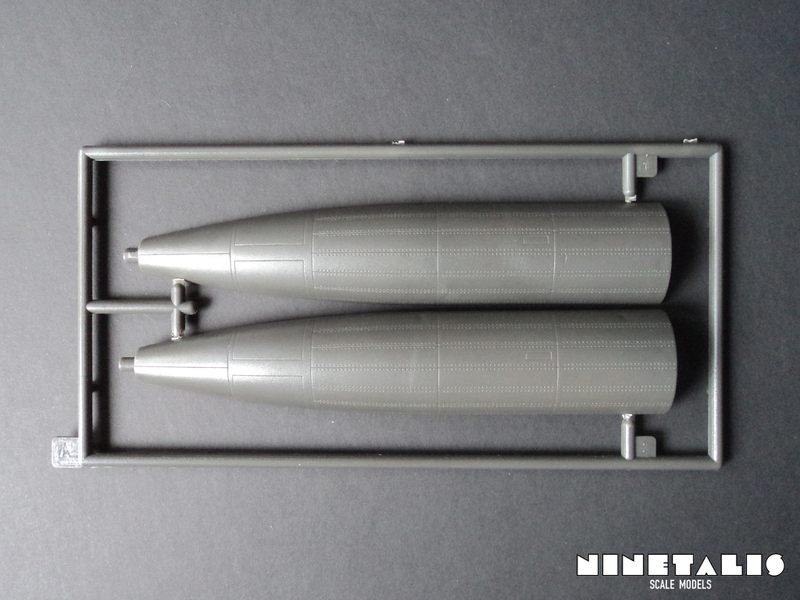 The largest sprue of the kit only holds two parts, which are the top halves of the rocket. 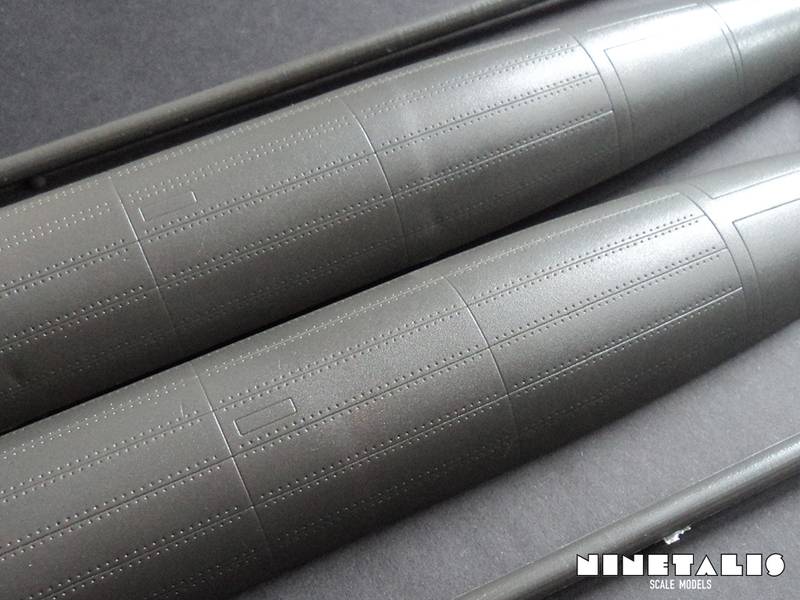 These feature recessed panel lines and rivets all around and is very impressive to see on a kit of this type. 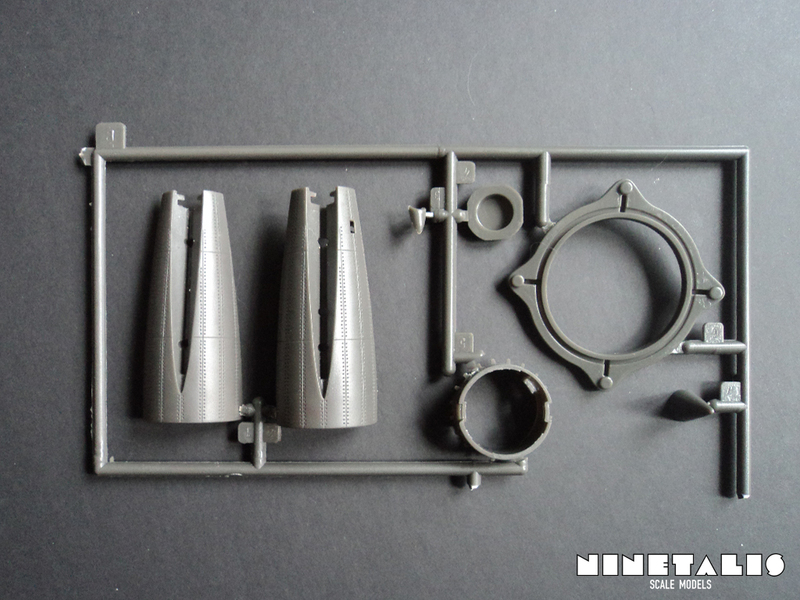 The second sprue features the lower two halves of the rocket, as well the ring in the middle to connect the upper and lower half together. 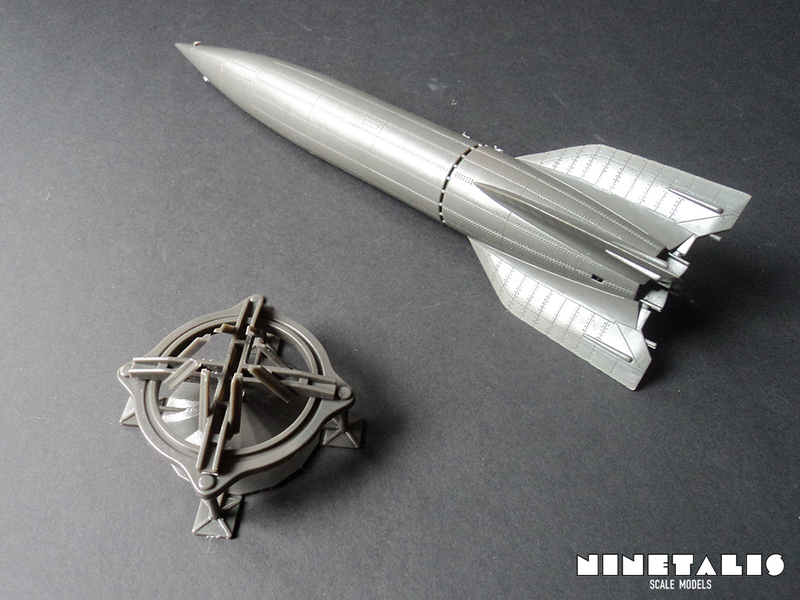 Also the top of the rocket is present on this sprue. 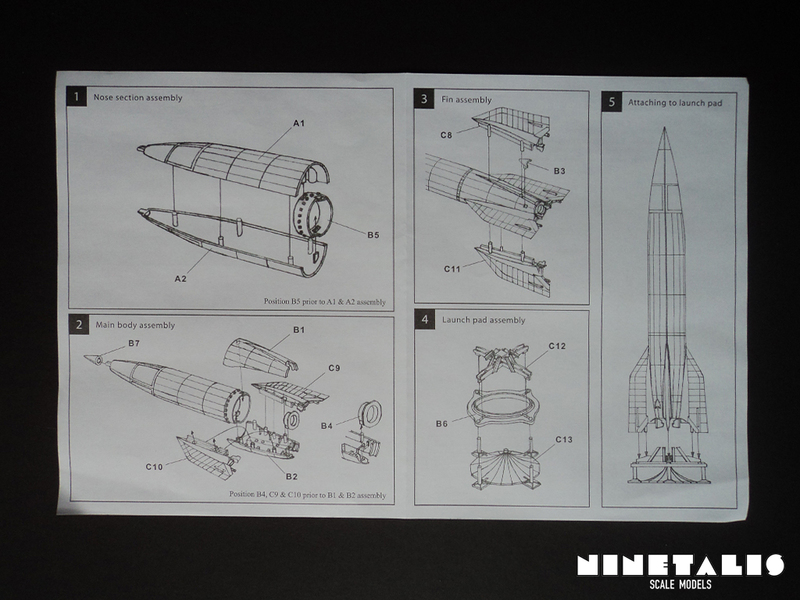 The last sprue holds the last two parts of the launcher, as well as the four fins of the rocket itself. Again we can find beautifully detailed parts sporting recessed panel lines and rivets all over on the appropriate places. Yep, stickers. No that is not a joke. Because this kit is ment for modellers of all levels, some stickers are added for the youngest of us. There are quite a few choices of stickers that can be found here, including a skull, some german WW1 insignia crosses and a cool shark mouth with accompanying eyes. No worries though, as Pegasus has provided two decals for the more serious modellers who want to build a historical version. As this is a snap kit, there aren’t many instruction steps involved. To be more exact, there are just five. One of them is is just to ‘show’ how to put the rocket on the launch pad. The instructions are however clear and detailed. 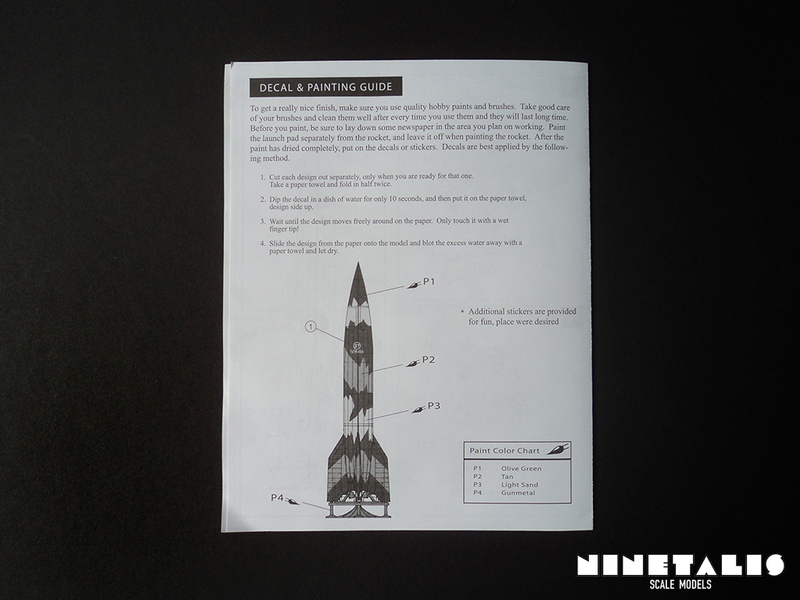 The kit can even be put together without the help of the instructions, so it should prove no problem to anyone trying to read these. 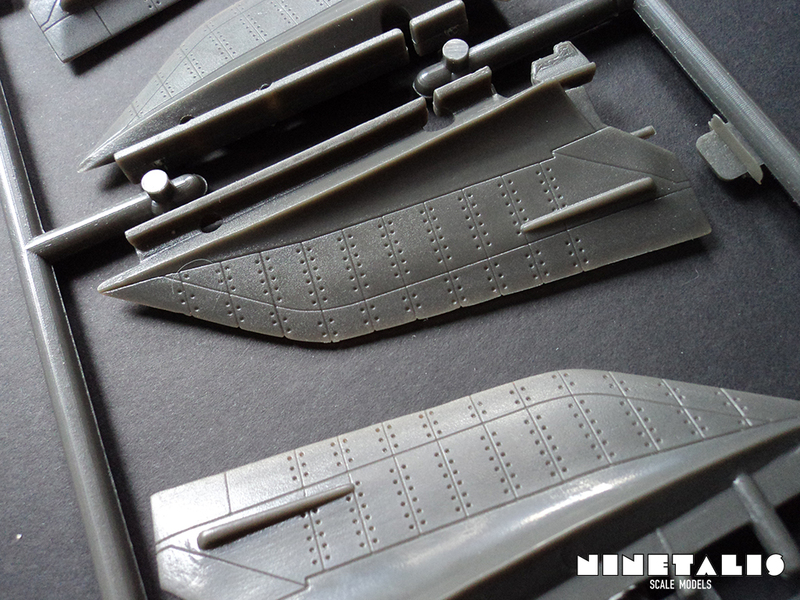 As said before, the kit provides a paint scheme for the serious modellers buying this kit. It sports a three-toned ‘splinter’ camouflage. 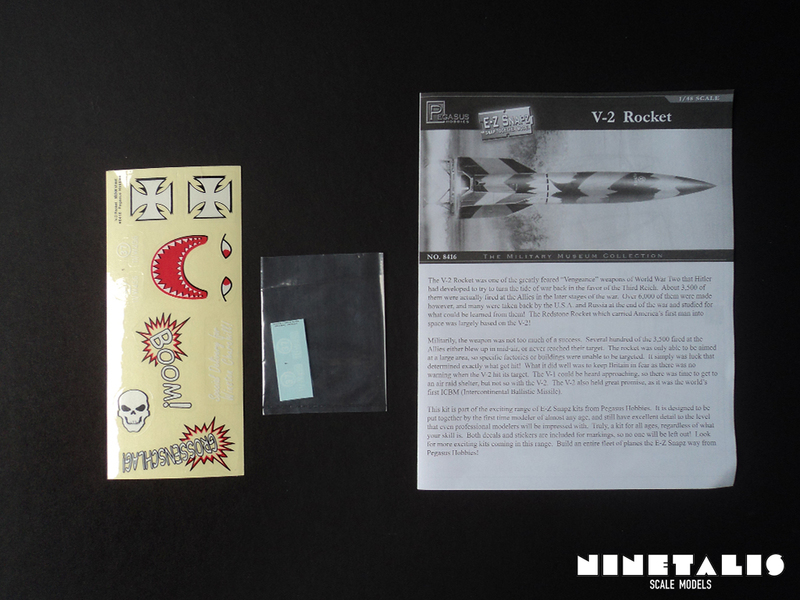 However, you can easily paint any historical paint scheme on your V2 that fits your liking, as most of these didn’t sport any sort of stencils or identification codes. This is a fine detailed and surprising scale model. Opening a kit and finding a sheet of ‘funny’ stickers instead of a decal sheet is not really what we want. 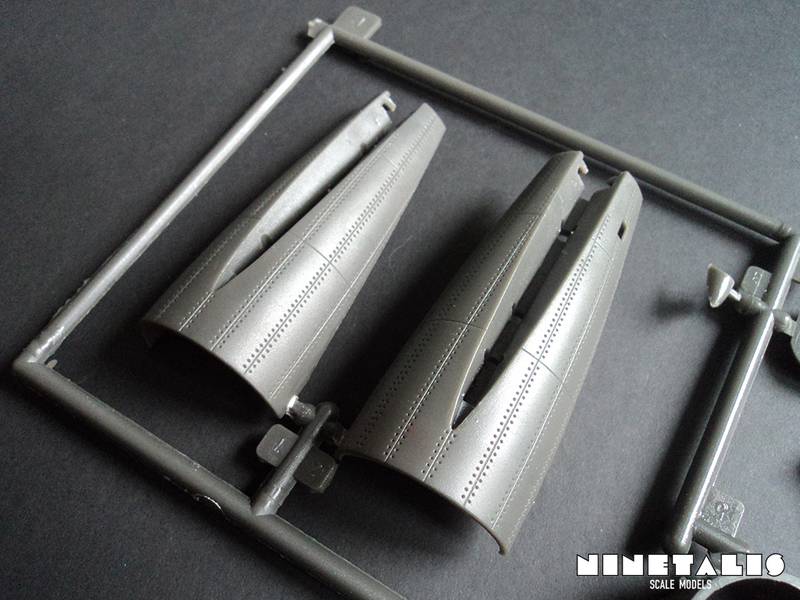 However, once you get to feel the perfect fit of these parts, you no longer have the feel that this is a ‘kid’s toy’, but a scale model that can be build by beginners and serious modellers alike. The picture I provided above shows the model assembled without any use of glue, as it holds itself together by a ingenious click system. It’s a great kit if you want introduce someone to the hobby or if you plan to do a small project yourself. Either case, this kit is really nice, only downside in my opinion is the decal that is provided, but then I look at the sticker sheet and feel like it is still better than nothing. The kit hits all the right marks, low parts count, low part count and easy assembly. The only reason why I didn’t give it a full score is because the detail could still have been a bit better, as well a few more markings and decals could have upped its value a bit. Adding a cart as the rest of the cart of the launcher would have made this kit complete, but that might be to much of wishful thinking on my part. Recommended for any level of scale modeller.